All Sea Eagle inflatable kayaks and rafts, as well as other high quality kayaks/rafts made by NRS & Aire, come with a repair kit. These repair kits work just fine for quick repairs usually encountered on day trips and the occasional overnight trip. However, for extended trips, especially trips that pass through remote terrain or for paddlers who travel solo, it is a good idea to have several spare parts that are essential to keeping the boat afloat and in good shape. Since I own a Sea Eagle Explorer Series inflatable kayak (an SE 380x) and a Sea Eagle inflatable raft (an older and now discontinued SE8), the spare parts and other items mentioned in this article naturally cover Sea Eagle products. Thus, if you have a kayak or raft from a different manufacturer, many of the parts and other items mentioned in this article won’t work with your boat. However, since most boats from different manufacturers have similar designs, those of you who have a different brand boat can use the information in this article to track down spare parts for your own specific brand kayak or raft. So here’s a few essential items I’ve added to my emergency repair kit for my Sea Eagle 380x inflatable kayak. This item is for the Sea Eagle Explorer Series kayaks. These valves control the inflation/deflation of the boat. Should these valves fail, you’ll either watch your boat fully deflate or be unable to inflate it. I’ve never experienced a failure of this valve. However, the thought of having a boat I can’t inflate due to failure of this valve caused me to buy a spare and put it in my emergency repair kit. The price is cheap. The insurance it provides is huge. 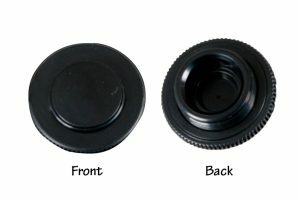 This small, inexpensive plastic tool is what you use to remove/replace a recessed one way drain valve (above). 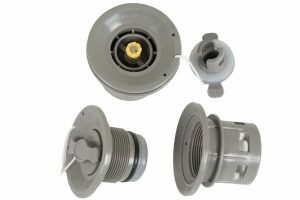 Without the tool, you won’t be able to remove a defective recessed one way drain vale. Standard Sea Eagle repair kits include this tool, so you only need to buy this tool if you’ve lost it or simply want a spare. All Sea Eagle Explorer Series inflatable kayaks are self-bailing. That means as water enters the boat, it will drain out through the drain valves provided the valves are opened. However, I typically use my kayak with the drain valves closed, so as to keep all water out of the boat. With the valves closed, the kayak converts to a “dry” kayak. Usually, most paddlers keep the drain valves closed and only open them when running rapids. Drain valve covers are kind of easy to lose. Mine have fallen off a few times when I twisted them the wrong way. So to make sure I could always close the drain cover, I bought a spare. For newer Sea Eagle Explorer kayaks (which have 16 drain valves), I suggest buying two spares. They are small and inexpensive and take up little space in your emergency repair kit. The Sea Eagle A-41 Large Bellows foot pump is well designed, for the most part. When not in use, you just step on the pump to remove all air from it, then use the plastic piece that is attached to the hose to “clamp the foot pump shut.” This allows the pump to easily be transported with little wasted space. 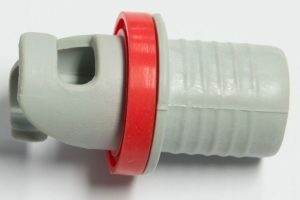 Moreover, attached to the pump’s hose are three different types of nozzles. These nozzles fit permanently inside the hose (unless you give them a really huge yank) and are used to inflate seats and the removable floor. Since these nozzles are permanently attached to the pump hose, they aren’t easily lost. The recessed valve adapter, which is required to inflate all Sea Eagle Explorer inflatable kayaks, isn’t attached to the hose. Instead, this valve adapter is stored in the repair kit. Since this adapter isn’t attached to the hose, and because you need to detach it to use the other nozzles of the pump, this valve adapter is easily lost. Indeed, I lost two of these valves before I finally worked out a system to avoid losing it. The patch kit that comes with all Sea Eagle kayaks and rafts is just fine for day trips and overnight trips, especially if you’re floating with a group. But for a week-long plus trip, especially where you float solo and thus can’t “borrow” a friend’s patch kit, I wanted the ability to either repair multiple punctures or to have the ability to deal with significant tears. Thus, I bought additional glue and the “Clam Seal” patch kit. The “Clam Seal” allows for easy and permanent repairs to nasty rips or punctures of the boat. Yep. Buy a small diameter, very compact roll of waterproof duct tape designed for backpackers. Duct tape uses are endless on float trips. Potential uses for boat repairs include repairing paddle damage, in the event you somehow manage to bend or damage the aluminum frame of the paddles. Or covering any holes that appear in the splashguard. And at camp, you’ll undoubtedly find uses for duct tape. Such as repairing a tent pole or covering a rip in a sleeping bag. You get the idea. Duct tape is like civilizations finest creation. And every floater on long trips or who passes through remote terrain should have some. Do You Really Need This Stuff? If you’ve read my article about Expedition Level Inflatable Kayaks, you’ll know that despite traveling thousands of miles in my Sea Eagle 380x, I’ve never once used any of these parts or patch kits. In other words, I’ve never developed a hole or tear in the boat (knock on wood). So why this page about essential repair items for a boat that is so tough and at times seemingly indestructible? Perhaps a few cliche’s will help anyone understand. Would You Rather Float or Walk Home? You get the idea. On long, solo float trips through remote terrain where cell phones don’t work, I want the ability to repair any nasty damage that happens to my boat. Walking home isn’t an option. Calling AAA is’t an option. Basically, I’m on my own and need to have the ability to deal with whatever boat damage happens. So I have a very small expanded emergency repair kit. And knock on wood, I’ve yet to ever use it. And hopefully my luck of “damage-free” floats will continue. But if it doesn’t, at least I shouldn’t have to walk, or swim, home.